We can transform this fun and unique venue into a stylish wedding setting or corporate party for your next event. The aircrafts on display add to the creative and playful ways that we can coordinate your catering, table design and entertainment for you. Do you want your event to take off? Whether It’s a wedding reception, town hall/AGM meeting, staff function, or even a fundraiser, we can create an event that is sure to be one your guests will long remember. The Memorial Room is a boardroom style event space that can accommodate 16 – 20 people for that small informal or formal meeting. What a great place to showcase your event as guests enjoy aviation history while viewing our vintage aircraft and artifacts. This area can accommodate up to 200 people, depending on the type of function you are hosting. Looking for a memorable setting? 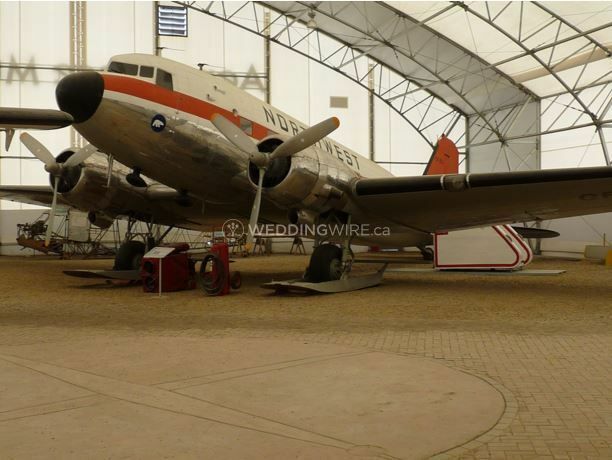 Consider having your Wedding Ceremony surrounded by the Lancaster Bomber, Twin Otter, DC-3 and other vintage aircraft. The Lancaster Room, which can accommodate up to 50 people, can be set up to accommodate your event requirements. For larger functions, the Lancaster Room is used in conjunction with the Main Hangar for buffet style meals. If you’re looking for a classroom, boardroom or theatre style set up, the Lancaster Room is a perfect choice!